This three-tiered base that has lost its cross, together with the headstone lying flat on the grass behind, are both on top of what is described in Jonathan Browning's obituary as a “family vault” . The cross in front was put up first, to remember his three children buried here between 1856 and 1860. Bostock was able to read the inscription on the headstone behind to Jonathan Samuel Browning and his wife (and their daughter and son-in-law, the Hazels), but this has recently been laid face down and the wording can no longer be seen. Jonathan Browning was born in Oxford in 1799 and baptised at St Aldate’s Church on 11 October, the son of the ironmonger James Browning and his wife Jane (probably the James Browning and Jane Browning who were married at St Thomas's Church on 14 February 1797) By the time his younger brother James Henry Browning was born in 1807, his father had moved his ironmongery business to St Martin’s parish, almost certainly to 57 Cornmarket Street. Jonathan's mother Jane died at the age of 48 and was buried at St Martin's churchyard on 12 February 1815. By 1823 Jonathan was in partnership with his father and the business was described in Pigot’s Directory that year as “Browning & Son”, with the address given as 57 Cornmarket Street. Jonathan's father James Browning died in St Clement's at the age of 65 and was buried in St Martin's churchyard on 20 November 1826. Hence Pigot’s Directory lists the family ironmongery business as “Jonathan S. Browning”. Ann Hester was born Oxford in 1802 and baptised at All Saints Church on 13 October. She was the daughter of John Hester, Steward and Manciple of All Souls College, and Susannah Torry, who were married in St Anne's Church in London in 1795. By the time of her wedding her father had retired to a fine house near Magdalen Bridge, which explains why she was described as being “of Cowley” at the time of her wedding. For more about Ann and her family, see the grave of her mother, Susannah Torry. Alice Browning (born in 1844 and baptised at St Giles’s Church on 6 September). The family was probably still living over their ironmonger's shop at 57 Cornmarket Street until 1832. Browning was a Liberal, and first joined the Common Council in 1827, and was elected Junior Chamberlain in 1830. In about 1832 Browning moved house, and thenceforth he is described as a “gentleman” living in “St Giles’s Fields” or “Park Place” (the name then given to the south end of the Banbury Road). His house, Northgate (nicknamed “Tinville”) was on the site of the Acland Home at 25 Banbury Road (now part of Keble College), and its address was sometimes given as 7 St Giles Road East. It was a sizeable house, as it had its own lodge which was occupied by his gardener. After the passing of the Municipal Corporations Act, Browning was elected councillor for the North Ward on 26 December 1835 and six days later was elected an Alderman for three years. He continued to be elected Alderman on every possible occasion thereafter. The 1841 census shows Jonathan (42), described as an ironmonger, living at their mansion Northgate with eight of their children: Maria Anne (12), Jane (10), James (9), Henry (7), Susannah (5), Emily (4), Frederick (2), and Mary (6 months). They also had four servants. Their eldest daughter Ann (16) is hard to find in that census. Later in 1841 Jonathan Browning was elected Mayor of Oxford (for 1841/2). He was nominated as Mayor again in 1848, but declined to serve and paid a £60 fine, because the role took too much time. At the time of the 1851 census, Jonathan (52), described as a “Magistrate and Alderman”, was living at Northgate with his wife Ann (48) and eight of their children, namely Ann (26), Maria (22), and Jane (20); Henry (17), who was the pupil of an architect; and, Susannah (15), Emily (13), Mary (10), and Alice (6), who were scholars at home. The family had a governess, cook, and two housemaids. Their sons James (19), Henry (14). and Frederick (12) are hard to find in that census, but were probably away at school. Jonathan Browning lost three of his children in quick succession in the 1850s, and must then have purchased a double plot in the cemetery so that he and his wife could one day be buried beside them. † Mary Browning died at the age of 15 in July 1856 and was buried at St Sepulchre’s Cemetery on 1 August (burial recorded in the parish register of St Giles’s Church). † Frederick William Browning died at the age of 20 in May 1859 and buried at St Sepulchre’s Cemetery on 5 May (burial recorded in the parish register of St Giles’s Church). † Henry Thorp Browning at the age of 26 in April 1860 and buried at St Sepulchre’s Cemetery on 17 April (burial recorded in the parish register of St Giles’s Church). On 28 October 1858 at St Giles's Church, Maria Ann Browning (29) married Henry Ward (26), the son of the coal merchant and former Mayor of Oxford William Ward. In Gardner’s Directory for 1852 Browning was described as a “Wholesale and retail ironmonger, and Agent for Ransome’s ploughs”. The business survived until about 1888, when it was taken over by a group of ironmongers called Isons, Kidman & Watts. By 1861 only his daughters Susannah (25), Emily (23), and Alice (16) were still at home. His 88-year-old mother-in-law Susanna Hester was living with them, and they had a live-in nurse and three house servants. On 30 March 1869 at St Giles's Church, Emily Browning married Robert Hunter, a solicitor of Kingston-upon-Thames and the son of the gentleman Robert Lachlin Hunter. At the time of the 1871 census Browning (72), described as an ironmonger, justice of the peace, and alderman, was living at Northgate with his daughters Susannah (35) and Alice (26), plus their three servants. On 6 June 1872 at St Giles's Church, Alice Browning married Henry Baines, a solicitor of St Giles and the son of the surgeon Joseph Baines. 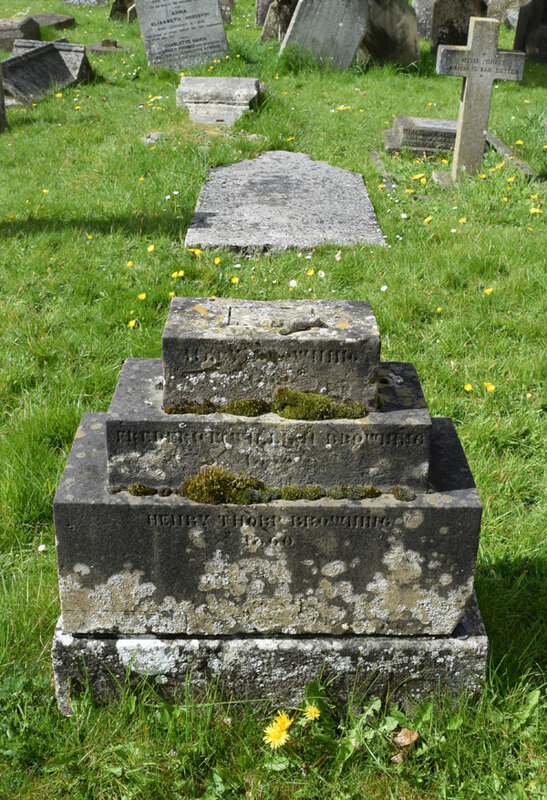 † Jonathan Samuel Browning died at Northgate House, Banbury Road on 25 March 1880 at the age of 81 and was buried on 31 March 1881 (burial recorded in parish register of St Giles’s Church). The funeral arrangements were efficiently carried out by Messrs. Elliston and Cavell, Magdalen Street. His effects came to under £20,000, and his executor was John Wood Sharman of Wellingborough, Northants. † Mrs Anne Browning née Hester died at Norham Gardens at the age of 79 on 23 November 1881. She was buried at St Sepulchre’s Cemetery on 26 November (burial recorded in parish register of St Giles’s Church). Her personal estate came to £2,344 15s. 9d., and her executor was her son-in-law Edward Wells Hazel. Edward Wells Hazel was born in Wallingford, Berkshire in 1819 and baptised at Crowmarsh Gifford on 1 July. He was the son of the Revd William Hazel and his wife Mary Eaton, who were married on 25 November 1802 at St Michael's Church in Cumnor. For more information about his parents and early life, see his mother's grave. On 21 September 1852 at St Giles's Church, he married Ann Hester Browning (see above). They do not appear to have had any children. At the time of the 1861 census Edward (41) and Ann (34) were living at 117 St Aldate's Street with two servants. In about 1872 Edward moved his office to 58 Cornmarket Street, and in the 1881 and 1891 census he and his wife can be seen living there, again with two servants. In the 1880s he went into partnership with Henry Baines (the husband of his wife's sister Alice), and the firm became known as Hazel & Baines. † Edward Wells Hazel died at 58 Cornmarket Street at the age of 77 in October 1896 and was buried at St Sepulchre’s Cemetery on 2 November (burial recorded in parish register of St Giles’s Church). His effects came to £7,502 2s. 11d., and his widow Ann was his executor. † Mrs Ann Hester Hazel née Browning died at 36 Banbury Road at the age of 82 in February 1909, and was buried in St Sepulchre’s Cemetery on 6 February (burial recorded in parish register of St Giles’s Church). Her effects came to £12,963 15s. 6d., and her executor was her sister Mrs Alice Baines. Hazel & Baines, solicitors, remained at 58 Cornmarket Street until the 1920s.